Ditch the monthly cable modem rental fees with the new ASUS CM-32, an all-in-one DOCSIS 3.0 compatible cable modem plus 802.11ac Wi-Fi router designed for today’s gigabit cable speeds. With a best-in-class Wi-Fi design featuring MU-MIMO support, 4x4 antenna for extended range and 1734Mbps of bandwidth on the 5GHz band plus 796Mbps on the 2.4GHz band, the CM-32 is perfect for 4K streaming, online gaming, video conferencing, live broadcasting, and more. For additional information and details on the ASUS CM-32, please visit us at ASUS Edge Up. 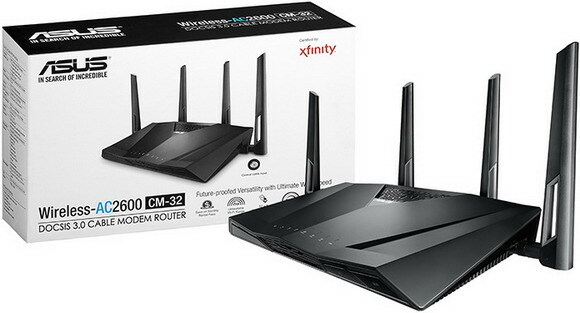 Powered by an Intel® Puma™ processor with certification for Comcast XFINITY and Spectrum networks, the CM-32 ensures worry-free compatibility right out of the box. ASUS CM-32 is available now at Amazon and other leading resellers with a suggested MSRP of $249.99. Please contact your local ASUS representative for additional information or visit us at ASUS Edge Up.